Jeff Smith: I’ve built more than my fair share of street-easy small block Chevys and one combination is a favorite. In the second half of the 1980’s – officially in 1986, Chevy converted small-blocks to a one-piece rear main seal which makes identifying these engines really easy. The reason you should look for a one-piece rear main seal engine is not just for the better rear main seal but because most of these engines came with a hydraulic roller camshaft. The best used engine combination to look for would be the Vortec small block used in L31-equipped pickup trucks from 1996 through 1998 and all the way into 2002 in some vans. These may be somewhat hard to find in complete condition, but what’ we’re emphasizing here is a combination of a one-piece rear main seal block with provisions for using a factory style hydraulic roller camshaft matched with a pair of iron Vortec heads. The heads are easy to identify as they have a distinctive saw-tooth casting mark on the end of each head. Let’s start with the short block and work out way up. If you find a short block in decent shape and you can still see a cross-hatch pattern on the cylinder walls with no outrageous lip at the top of the ring travel, you might be able to get away with using this short block with perhaps the addition of a new set of rings. These engines used cast pistons which are not the best for high rpm, but with your daily-driver approach, cast pistons would work just fine. Rebuilding the short block will not be overly expensive but could put you in a position of spending almost as much as a brand new crate engine, so you have to do your homework and plan out the entire build. At the very least, pull the rear cover and replace the one-piece rear main seal when you pull the pan off to inspect the bottom end. Another advantage of these engines is they use a one-piece oil pan gasket that helps prevent oil leaks. The most important reason for using this vintage block is because it allows you to add a mild performance hydraulic roller camshaft while re-using the existing hydraulic roller lifters. Often the lifters may be worn and not serviceable but that’s okay because replacement lifters from Sealed-Power are a pretty good deal at just under $150 for the set. This is compared to retro-fit hydraulic roller lifters that can cost $450. Plus, the factory roller cam block uses a built-in limiter plate to prevent cam walk so you don’t have to mess with a button or dialing in the endplay. So at worse you might have to buy a hydraulic roller cam and factory lifters. The lifters are aligned in the bores with what are called dog bones and all 16 are retained with a large spring called a spider. All of these parts are easily obtained and not expensive. You may need to purchase them because some one-piece rear main seal truck engines came with flat tappet cams but used this same block. All you have to do to convert to a roller cam is buy the front retainer plate, the dog bones, and the spider. Our recommendation for a camshaft would be something mild along the lines of the very streetable GM HOT cam. The GM HOT cam was designed around a 1.6:1 roller rocker arm with specs of 218/228 degrees of duration at .050-inch tappet lift with a lobe separation angle (LSA) of 112 degrees. With a 1.6:1 roller rocker, this opens the valves to 0.525-inch for both the intake and exhaust. This would be too much valve lift for the stock Vortec heads which are limited to a maximum of 0.450-inch valve lift before the retainers hit the valve guide seals. If you run a 1.5:1 rocker arm, this cuts the lift back to roughly 0.490-inch lift, which is still too much. But there’s a solution. The Vortec iron small-block Chevy head offer 1.94/1.60-inch vales and 64cc combustion chambers and flow better than any other production iron small-block Chevy head. Their limitation is a limited valve lift potential. 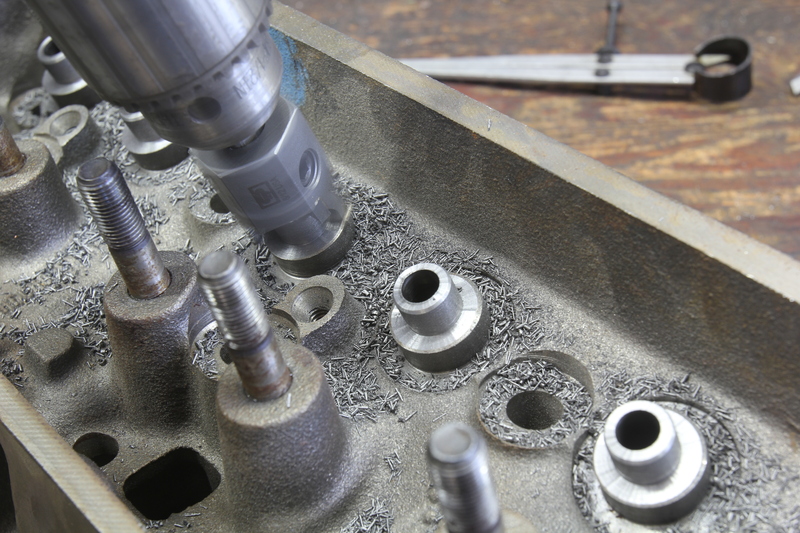 Machining the guides to increase the retainer-to-seal clearance is an inexpensive way to convert these heads to use a bigger cam with valve lifts up to 0.550-inch. There are two ways to approach modifying the Vortec heads to accept additional valve lift. The first is to have a machine shop modify the valve guides to lower the guide height so there’s plenty of clearance to the retainer. Then you can run a single spring with a damper with about 120 pounds of seat pressure and this will offer excellent control. The second way is to leave the heads stock but use a set of COMP Cams beehive springs such as the PN 26918. This spring also requires a dedicated retainer and locks and the entire kit is available under PN 26918CS-KIT. This kit goes for a steep $329 but that also means you don’t have to spend any money at the machine shop. There are other avenues as well, but these are the two most popular ways to combine the Vortec heads with a cam that pushes the valve open to between 0.500 to 0.525-inch lift. So with the heads and cam chosen, the only thing really left to do is to specify the intake manifold and carburetor. The intake is simple since the best one for the dedicated 8-bolt Vortec cylinder head intake pattern is the Edelbrock Performer RPM (PN 7116). As for carburetors, if you don’t already have a 600 cfm Holley carburetor at your disposal, then that’s what I would recommend. 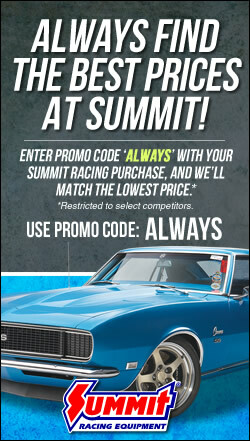 The generic PN 0-1850S Holley is very inexpensive at only $277.16 from Summit Racing and will bolt right on and work very well on this package. The engine might make slightly more power with a larger carburetor like a 750 cfm vacuum secondary Holley, but the increase in power would be minimal. The impact on drivability and fuel mileage makes the smaller Holley the best choice. All told, this package would make an excellent daily-driver small-block that has the potential with headers and a good dual exhaust system of making between 350 to 375 flywheel horsepower or nearly 300 horsepower at the rear tires. Follow this outline and you will be very happy with the results. I like your approach. Evenly matched, and built more towards street low and midrange. What about exhaust? 2″ pipes with 1 3/4″ headers, 3″ collector? Mr. Smith, thanks for the always interesting articles! I don’t understand a little detail: how exactly does a set of springs, to limit the valve lift from 0.490 to barely 0.450? In the case of the Vortec heads, it’s actually the height of the valve guide boss that limits total valve lift. Beyond roughly 0.450-inch of valve lift, the bottom of the retainer will hit the valve guide seal that is mounted on the guide boss. You can either machine the guide boss lower or install different springs, like the beehive springs which will increase the the height and allow more valve lift. I always get a little confused when I hear you can’t do more than .425 lift on a vortec head…mostly because I did it for my daily driver. This actually explained why it was possible, and that was through the comp cams beehive springs and 1.52 rockers that allow that to happen. One thing to check is mechanical or Electric fuel pump. Some have the mount, but not the hole drilled for the pump push rod. I am not certain but some used PM, powered Metal or “pink” rods. These are “fractured” at the big end cap. They cannot be honed I believe, just something to remember. Also, “How to Build High Performance Chevy Small Blocks ona Budget” by David Vizard. Vols 1 & 2 are both great!